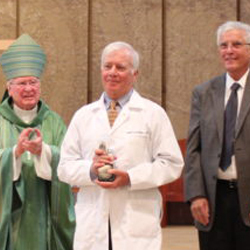 Each year, Mission Doctors Association recognizes and honors a Catholic Doctor whose work is a reflection of their faith, whether to their own community or around the world. 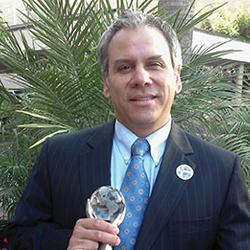 Learn more about the award here. 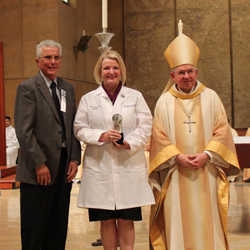 Below are the past recipients of our Catholic Doctor of the Year Award. 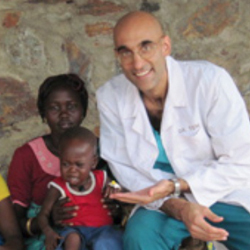 Dr. Tom Catena is a Aurora Prize Laureate and Catholic international missionary doctor who has served since 2017 as the only permanent doctor at Mother of Mercy Hospital caring for 750,000 people in Sudan’s war-torn Nuba Mountains. 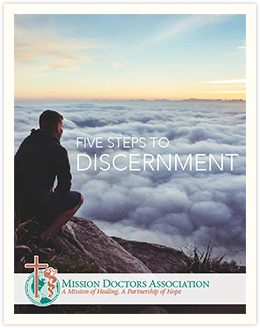 Dr. Catena is inspired by the faith and work of Saint Mother Teresa of Calcutta and St. Francis of Assisi and says that it is their example that motivates him while working 7 days a week. He has been featured in the documentary “The Heart of Nuba” and begins each day with prayer. Dr. Gina Lawson, a hospitalist with more than 25 years’ experience in hospital care in St. Luke’s Health System (Missouri), received the award for her caring commitment to the sick, the homeless and the discouraged. She has gone on multiple international mission trips, has been distinguished for the way she focuses on families and patients with her full attention, and is noted for praying with patients she cares for. Father John “Jack” McCarthy, OPraem, MD and Father Maurice Schroeder, OMI, MD have worked for more than 30 years in the Peruvian Amazon caring for the body and soul of more than 20,000 individuals in 100 villages up and down the Napo River from Santa Clotilde Mission. Fr. 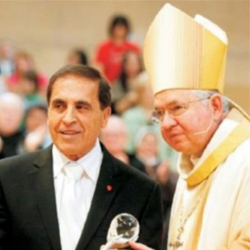 McCarthy, MD is a Norbertine Priest and member of St. Norbert Abby in De Pere, WI. Fr. Schroeder, MD is a Missionary Oblate of Mary Immaculate of St. Peter’s and St Paul’s Provinces in Canada. 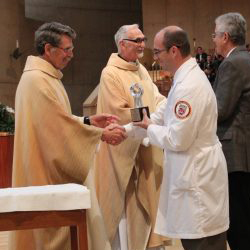 Together, these two priest physicians have been a source of care and hope. 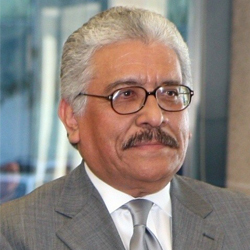 Dr. Enriquez practices family medicine at Franklin Medical Center in El Paso. 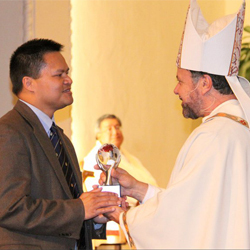 He was recognized “for the faith-filled care he provides to his local community,” offering his time free of charge and often making house calls, and also for his work caring for the poor in Honduras and the border areas of Texas and Mexico. 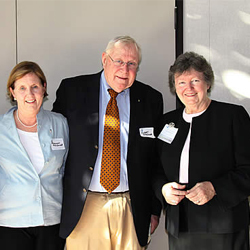 Dr. Daly was recognized for his volunteer work in orthopedic surgery for St. Mary’s Free Health Center in Minneapolis / St. Paul, his work at St. Lucia West Indies, Haiti, and the founding of the Holy Family Surgery Center in Honduras. Dr. Daly has organized numerous medical missions to Honduras, including organizing brigades with urologists, ENT, and general surgeons. 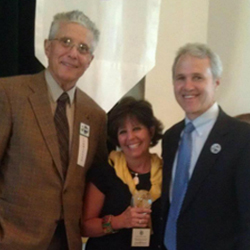 Dr. Fitzgerald was recognized for his commitment to his community through volunteering with the Poverello Clinic, a free clinic for the uninsured. He serves each year as a volunteer physician, accompanying the sick and disabled on a pilgrimage to the Shrine of Our Lady of Lourdes in France. His service has also taken him to the Sacre Coeur Hospital in Milot, Haiti, and to work with Haitian physicians who come to the US for special training.